Welcome back to the Tie Back Tank SewAlong! Today we will be attaching our neck and arm bands or binding! If you still need the pattern, you can grab it here (aff link). At this point, you should have the back of your tank hemmed, and attached at the shoulders. 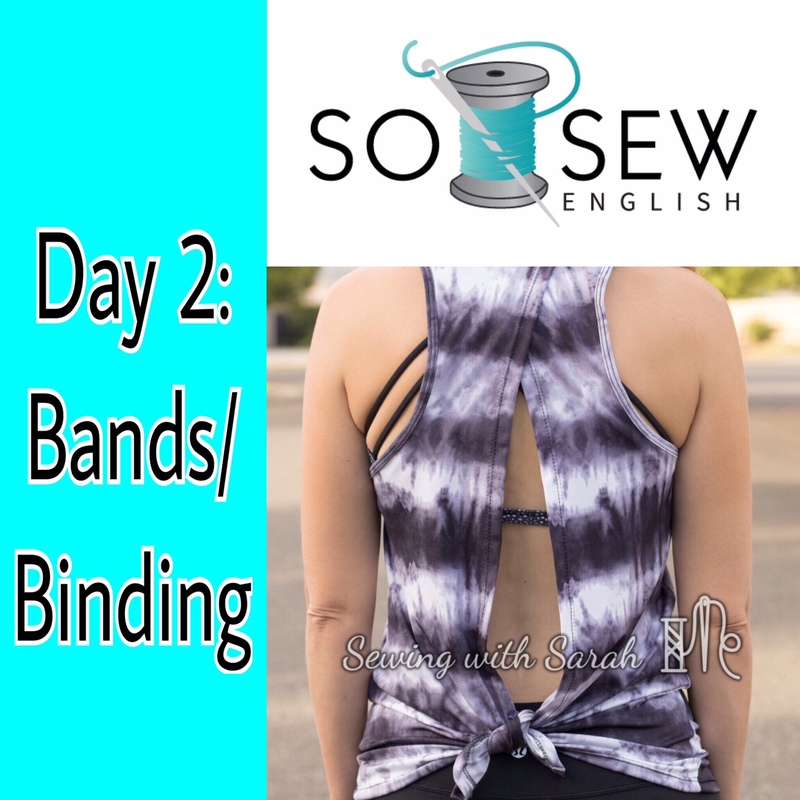 My video will demonstrate how to attach a NECKBAND and an ARM BINDING. You’ll need a tape measure, your rotary cutter, some pins/clips, and your sewing machine or serger. I apologize if your audio doesn’t track with the visuals exactly- I’m not sure why this is happening- but please just watch my hands and not my mouth, OK? They’re doing all the important work anyway- I’m just trying to keep myself awake with all my chatter! Here’s an alternative method that I used when I was binding the Open Back Top– it’s more of a “double fold” method. After today, you’ll be almost there- I can’t wait to see all those finished tanks! Do you enjoy these posts and videos? Subscribe to my blog and “Like” my page on Facebook for regular updates! Hi Sarah, One question I have is where exactly do you topstitch your bands and bindings? Do you topstitch on the binding / band piece? Or do you topstitch below on the garment? I do all my topstitching with a double needle and have decided it looks best to me to topstitch on the garment to hold the banded seam down. I have not decided yet where the topstitching looks or works best for the bindings though. Thank you. Hi! I topstitch on the bodice with the seam allowance pressed down. I don’t typically topstitch wider bands- but this one is fairly narrow so I feel like it needs it to stay flat. Bindings are topstitched on the binding itself, to hold the fold. Hope that helps and thank you for following along! Yes it does make sense and that is what I thought it looked like in the picture. I believe this is the first time I’ve ever used a binding option and I like the look. Thank you.